OPINION: How did the media get the Donald Trump story so wrong? "This is a historic night,'' with those words Donald Trump was welcomed in as the US president to rousing applause and theatrical music. "The American people have spoken and the American people have elected their new champion,'' vice president Mike Pence declared. "America has elected a new President. It's almost hard for me to express the honour that I and my family feel that we will have the privilege to serve as your Vice-President of the United States of America." Chants of USA, USA, USA then broke out. Mr Trump confirmed he had received a call from Hillary Clinton congratulating "us on our victory". "Thank you very much everybody. Sorry to keep you waiting. Complicated business. Complicated. "I've just received a call from Secretary Clinton. She congratulated us - it's about us - on our victory and I congratulated her and her family on a very, very hard-fought campaign. "I mean, she fought very hard. Hillary has worked very long and very hard over a long period of time and we owe her a major debt of gratitude for her service to our country. "I mean that very sincerely. "Now it's time for America to bind the wounds of division. We have to get together. To all Republicans and Democrats and independents across this nation, I say, it is time for us to come together as one united people. Mr Trump promised he would not let Americans down. "We are going to fix our inner cities, we're gonna rebuild our highways, tunnels, hospitals... we will rebuild our infrastructure"
"The forgotten men and women of our country will be forgotten no longer"
"Ours was not a campaign but rather an incredible and great movement made up of millions of hardworking men and women who wanted a better future for themselves and for their country"
Trump concluded his speech, kissed his family as the Rolling Stones' song "You can't always get what you want" rang out across the room. At 2.22am New York time, AP reports Donald Trump arrived at his election night headquarters. A short time later, Hillary Clinton called Trump to concede defeat. Trump's motorcade travelled from nearby Trump Tower to the midtown hotel where thousands of his supporters and hundreds of reporters are gathered. Trump is expected to address the crowd. It came after Hillary Clinton refused to concede or address her supporters. 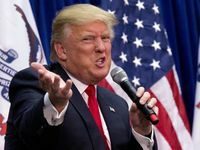 Earlier, ABC election analyst Antony Green says Donald Trump has secured enough Electoral College votes to claim the US presidency. "These are the current numbers, 259 for the Republicans, if you give Pennsylvania to the Republicans, 279. "We think the Republicans will win Wisconsin as well. So they've got two paths. "But Associated Press have given Pennsylvania away and they've got 97% of the votes counted of the precincts counted in Pennsylvania and the Republicans are more than 1 per cent ahead. "It looks like that's the state that's put Donald Trump over the quota and into the White House." Hillary Clinton supporters have been seen openly weeping on television around the world as they reflect on the shock and disbelief being felt over the US election. With many now predicting a likely Donald Trump victory in the US presidential election, no one is more surprised than his Democrat challenger's most passionate supporters. Supporters are trailing out of Clinton's post-election party in New York in tears, news.com.au's Charlotte Willis reports. It's now past midnight and people don't want to be there when the final announcement comes through. They don't want to hear her speech. Some Clinton supporters are too scared to go home, no one wants to get on the subway right now for fear that it will be too chaotic and they will run into rowdy Trump supporters. An ABC reporter at the venue said the atmosphere was "depressed" and being there was "like covering a wake". The Canadian immigration site has even crashed as people inquire about leaving the US. What Donald Trump will mean for Australia? Australian experts were shocked and said a Trump presidency could cost us free trade agreements that would have benefited regional Australia. An international political expert has warned the impact of a Trump victory could result in America pulling out of international agreements. University of Queensland political scientist Sarah Percy said Mr Trump would likely be the most protectionist president in more than three decades. 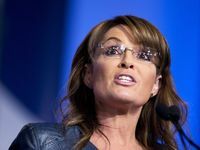 "He's very likely to pull out of the Trans-Pacific Partnership -- which is a deal that would have benefited people in export economies - be that agriculture or resources," she said. "We haven't seen a president who was completely protectionist since before 1980." Associate Professor Percy said a Mr Trump victory could impact multilateral international agreements including alliances. "I expect there will be a broad shift on any multilateral alliance including the Australian-US alliance. Goodness knows where that will go," she said. Griffith University political expert Paul Williams said more protectionist policies would make it harder for Australian primary producers to access the American market. "There is concerns from both sides of politics, here and in the United States, that Trump's protectionism is bad news for free trade generally," he said. "That means it's just going to be harder for Australians primary producers to get their product into the US." Mr Trump has already faced criticism from the Queensland and NSW state governments. Queensland Deputy Premier Jackie Trad on Wednesday called Mr Trump "bigoted". In October the NSW parliament unanimously agreed Mr Trump was a "revolting slug unfit for public office". Financial markets around the world were showing volatility as Trump edged towards the win. About $35 billion was wiped from the value of Australian shares partway through trading and the ASX dropped 2.7%. In America, the Nasdaq futures market dropped about 5% and the Mexican peso dropped about 10%. Queensland Sugar Limited general manager of trading and risk Dougall Lodge said the company was expecting commodity prices to react to the shock election result. "Overnight trading is going to be very volatile, we'll have to see how the dust settles," he said. Mr Lodge said it was too soon to say how the election of the Republican candidate would affect the sugar industry. "The only thing we're sure of is that it's going to be volatile," he said. Did Donald Trump check on how his wife voted? Chinese state media says that Donald Trump as president is what happens if people have democracies. The state-run Xinhua News Agency has said that the likely election of the controversial Republican candidate just shows how America's democracy brings about crisis, in contrast to the stability of China's authoritarian rule. The campaign - and Donald Trump's apparent ascension to the highest office in the world - shows how "the majority of Americans are rebelling against the U.S.'s political class and financial elites", the paper wrote. The official Communist Party newspaper People's Daily says in a commentary that the presidential election reveals an "ill democracy." China's state media and government-backed commentators have actually supported Donald Trump throughout the election campaign. Like Russia, China is seen as favoring Trump because he appears less willing to confront China's newly robust foreign policy, particularly in the South China Sea. 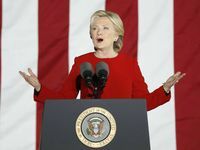 Clinton, by contrast, is disliked in Beijing for having steered the U.S. "pivot" to Asia aimed at strengthening U.S. engagement with the region, particularly in the military sphere. Writing in the Communist Party newspaper Global Times, scholar Mei Xinyu says: "From a comprehensive view, it would make it easier for China to cope if Trump is elected. This is because under the policy line advocated by Obama and Clinton, the political and military frictions between China and the U.S. will be more frequent." On Tuesday, the Chinese state broadcaster CCTV ran man-on-the-street interviews with unidentified American voters in which they expressed disgust with the system and dissatisfaction with both candidates. A SENIOR aide to Donald Trump has declared victory for the Republican politician, following favourable early poll results. Layne Bangerter, director of the Trump for President campaign in Idaho, told the Press Association: "We're not over confident but now we are calling it. Florida is over. North Carolina, we're going to win. "He keeps marching through Ohio- this is all we need. He'll keep going to the west- he's going to pick up ever state, possibly Colorado, on into Utah, Nevada. "New Mexico he will probably not win. But that will show the trend of the night because we're picking up states like Virginia. "I'm saying it's over- the voice of the people has risen up." Results are still unfolding. Poll projections suggest Mr Trump has a strong chance of winning the election, after a strong performance in key swing state Florida. The Republican has also won Ohio and North Carolina. Victory is still possible for Ms Clinton, who has won major states including Virginia. However, in order to triumph she fights an uphill battle including having to take Colorado and Nevada. THE New York Times has now given Donald Trump more than 95% chance of winning the US presidential election. Trump has won North Carolina, Ohio and Florida - the three biggest battlegrounds in the election. If he holds his lead in New Hampshire, Michigan and Wisconsin, he's pretty much got the presidency in the bag. Ohio has been given to Mr Trump with more than 53% of the votes counted while Florida will fall to the Republicans. California has been won by the Democrats, as expected, while Idaho has gone to Trump, also something that is not a surprise. Dow Jones futures are down more than 700 points. The US dollar is plummeting. And reportedly the Canadian immigration site has crashed. Polls are now closed in every state but Alaska. AP and the ABC both called Florida for Mr Trump shortly after 3pm AEDT. Earlier, Hillary Clinton had 47.7 per cent of the vote in the key state of Florida. Donald Trump has 49.2 per cent. He was more than 140,000 votes ahead. Full results are yet to come in and around 94 per cent of the state's votes have been counted. The winning candidate needs more than 270 electoral votes and Florida has a significant 29 votes up for grabs. Its swing state status means it tends to have no significant support for either party, therefore a win for the Democrats or Republicans is a key victory and a good opportunity to win electoral votes. It is one of 13 important swing states across the US. Trump is also leading, easily, in Ohio and North Carolina - by fewer than 2000 votes. 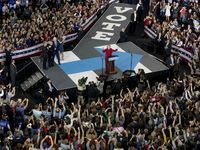 Westpac senior markets strategist Imre Speizer said while the markets were expecting a Clinton win early on, this had swung to thinking Trump would win. Trump has 139 electoral votes and Clinton has 104 in the crucial race to 270. Trump has won 13 states including Texas and Arkansas and Hillary Clinton has won these states: New York, Vermont, Illinois, New Jersey, Massachusetts, Maryland, Delaware, Rhode Island and Washington D.C.
None of those states were expected to be competitive. Meanwhile, Hillary Clinton has tweeted this amazing picture. In 2012, it was the last state to be called in the presidential election and was also the closest. Tampa was the site of the Republican National Convention, but the state ultimately went to president Barack Obama with 50.01 per cent of the vote and 49.13 per cent to Republican Mitt Romney. Florida is one of the first swing states to close its polls and release the results. Earlier, Mrs Clinton was leading Republican rival Donald Trump by two Electoral College votes. But the Republicans were expected to retain control of the house of representatives. With voting complete in more than half of the 50 US states, the race was too close to call in Ohio, Florida, North Carolina, New Hampshire and Virginia. They are all states that could be vital to deciding which contender wins the presidency. Both candidates scored early victories in states where they were expected to win. The NYT was tipping Florida was likely to go to Mr Trump. Mr Trump captured conservative states in the South and Midwest, while Mrs Clinton swept several states on the East Coast and Illinois in the Midwest. There are 270 Electoral College votes needed to win. A TEXAS man has been arrested for trying to cast more than one vote in the US election. The man was picked up by police in Fort Bend County. ONE person has been killed and at least four people have been injured after an active shooter opened fire near a polling station in Azusa, a suburrb of Los Angeles. Los Angeles county sheriff captain Jeff Scorggin said authorities were dealing with one suspect who was heavily armed. California Shooting: One dead: NBCLA reports on shooting near polling booth. At least of the victims was headed to the polling station to vote, a law enforcement source told The Times. Officers arrived to find a man with a rifle. The gunman immediately fired at least 20 shots at police, said the source. Under a hail of gunfire, officers took cover and returned shots at the man, who retreated into a home in the 500 block of Fourth Street, said the source, who requested anonymity because the case was ongoing. The shooting took place in a residential neighbourhood about 2pm local time, and police said that four gunshot victims were being treated for their injuries. The extent of their injuries is not known as police said the situation was not "contained". Officer Jerry Willison of the Azusa police department said the situation as "very volatile and critical". Critical Incident: Please stay out of the area of Fourth St & Orange Ave. All residents in the area shelter in place. As shots rang out, people started to run inside the polling station at the Memorial Park and Slauson Middle School before officials closed the doors. Elizabeth Hopkinson told NBC that she and her 9-month-old son were locked down at Slauson Middle School nearby, and that she was going to vote when the shooting happened. She said she heard, "pow, pows, then a rain of fire." She was one of 25 people locked in the gym, as well as a group of children. The shots did not happen inside the polling station. A witness told CNN he heard a "massive shooting is happening and the police have told us to stay indoors. We are currently locked down". Another female voter, who spoke on condition of anonymity, told CNN that she was inside the polling station when she heard shots ring out. "At first, I thought it was construction but people came running into the room saying they see a guy with a bulletproof vest and a white shirt. "As of right now, they just have us in the voting room and are trying to keep us calm." A helicopter has transported at least two victims to hospital. Police have urged residents to stay indoors. The gunman was found dead in a home. It remains unclear whether the man was killed by police gunfire, or from a self-inflicted gunshot wound. Trump to win Indiana, Kentucky; Clinton set to take Vermont. The earliest states are being called after voting booths on America's east coast closed. Donald Trump is predicted to win Indiana and Kentucky. Pollsters Five Thirty Eight predicted he was more than 97% likely to win the states. Both were widely predicted to stay in the hands of Republicans, and are considered safe states. Ohio was considered a battleground state -- one that could fall to the Democrats if the swing against Mr Trump was powerful enough. Ohio was however considered a "must-win" for Republicans if they were to have a shot at the White House. Vermont is expected to stay with Hillary Clinton. No surprises there. THE first polls have closed in the US election, and these are must-win states if Donald Trump is to have any hope of upsetting the polls that are widely predicting a decisive win for Hillary Clinton. The important states to watch are the swing states of Florida, New Hampshire and Virginia. He is widely predicted to North Carolina and Florida, but if either of those red states turn blue, his chances of taking the presidency fall to close to nil. As of 9.40am AEST, Mr Trump has 53% of the vote so far in New Hampshire and 75% of the votes counted so far in Kentucky. As North Carolina, Florida and Ohio counting begins, we could soon be given an early indication of how Mr Trump's campaign is going. Early voting numbers and turnout figures, however, bode less well for Mr Trump. Mr Trump's policies on Mexican immigration, the building of a border wall and the plot to deport potentially millions of illegal immigrants may have galvanised the influential Hispanic community in the US. If early numbers on Hispanic voter turnout play out consistently, it could deliver a heavy blow to Mr Trump's campaign fortunes. Most Hispanic voters live in states that are set in stone for either Democrats or Republicans -- California, Texas and New York -- but there are key populations in the swinging states of Florida, Nevada and Colorado. If this group proves a powerful force in this election, it could change the way both parties campaign, and will deliver more influence to the Hispanic community. DONALD Trump Jr has said that his father will accept the result of the election - with one big caveat. As long as the voting is "legit and fair", he said, his father will accept that he has lost. With polls suggesting Mrs Clinton had a narrow lead before election day, Donald Trump Jr said his father would concede defeat if he loses, provide the result is "legit and fair". He told MSNBC: "All we've wanted is a fair fight. "If he loses and it's legit and fair, and there's not obvious stuff out there - without question, yes." Although the candidate himself is not so sure. He told Fox news earlier today that he would not necessarily accept the result of the election, unless he wins of course. It will depend on "how things play out", Mr Trump said. "Hopefully they'll play out well and hopefully we won't have to worry about it, meaning hopefully we'll win. "We will see how they play out. "I want to see everything honest." Barack Obama has said that he still has faith in the American people after a bitter election campaign. Lines were long in some areas as voters chose between Democrat Hillary Clinton, Republican Donald Trump and some third-party candidates. Obama supports Clinton and voted early last month in his Chicago hometown. He spoke while walking from the White House residence to the Oval Office, following his Election Day tradition of playing basketball with friends. The probabilities are moving slightly towards a Trump win - but not enough to make a difference. 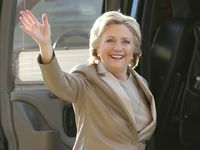 Bookmaker Paddy Power said Clinton's chance of taking the White House dipped slightly to 81.8 percent on Election Day from 83.3 percent, while Trump's probability improved to 22 percent from 20 percent. "The flow of money is relatively even with it slightly favoring Trump," said a Paddy Power spokesman. He said Paddy Power has seen at least 20 four- and five-figure bets placed on Tuesday. Different bookmakers and exchanges have different closing times for placing bets. Much as the presidential election is spectacular, the House is likely to be both closer and ultimately just as important. It's looking like the Republicans are going to do well. Republicans seemed on track to secure two more years of House control in Tuesday's elections but with erosion of their historic majority, leaving hard-line conservatives with added clout to vex party leaders. With Donald Trump rousing opposition in many suburban and ethnically diverse districts, Democrats were hoping to gain a dozen seats or more. Chief targets included GOP incumbents in Virginia, New Jersey, Illinois, Florida, Nevada and California. But both sides anticipated that Democrats would fall short of the 30-seat pickup they'd need to take command of the House for the first time in six years. Democrats have gained that many seats in just five of the 35 elections since World War II, including only once - in 2006 - since the 1970s. One prized pelt would be eight-term Rep. Darrell Issa, R-Calif., who dogged President Barack Obama with probes into the 2012 killings of four Americans in Benghazi, Libya, and IRS mistreatment of conservative groups. Another would be Rep. Scott Garrett, R-N.J., from New York City's suburbs, under fire for reports he'd objected to contributing money for gay GOP congressional candidates. Nate Silver, the renowned pollster who has seriously talked up the chances of Donald Trump winning today's election, has released his final forecast. 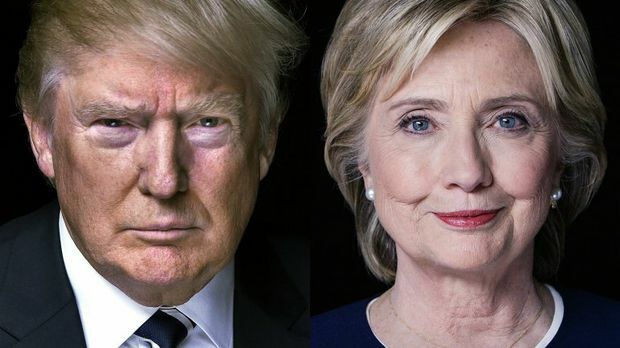 And it is good news for Hillary Clinton, with Silver's model now giving her a 71.4 per cent chance of victory compared to Mr Trump's 28.6 per cent. Silver's FiveThirtyEight project had come in for some criticism in the last week after it gave Mr Trump a chunky 35 per cent chance of becoming president. With Ms Clinton only a 65 per cent favourite, that was seen as an outlier compared to other models. HuffPost Pollster was giving Ms Clinton a 98 per cent chance of winning, while The New York Times' model at The Upshot had her at 85 per cent. 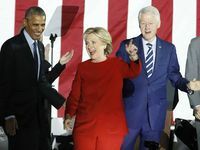 Releasing his final forecast, Silver noted that there was a gap between the Electoral College and the national vote, with Ms Clinton 81 per cent likely to get the overall majority of votes in the latter. Silver has justified giving Mr Trump such high chances in the past on the basis that, with the polls all pretty tight, many different scenarios remain possible. But he tweeted as his final forecast came out that "show Clinton winning pretty much the same states as everyone else". Significantly, Silver said the key swing states of Florida, Nevada, North Carolina and Maine (2) had "flipped narrowly to her in the past 48 hours". "However, we continue to believe that other forecasts overstate [certainty]," he added. Did Donald Trump check whether wife voted for him? How did media get the Donald Trump story so wrong?